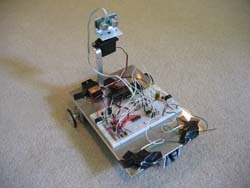 The project for 2008 was a student designed and built their own robotic car platform used for several of the labs. 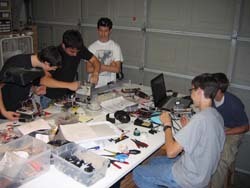 Each student purchased the parts. See Parts List. 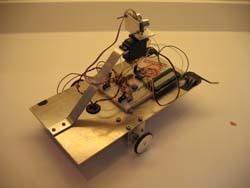 The student wired their car following two schematics. See Schematic 1 and Schematic 2. 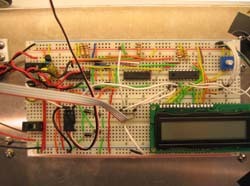 The PIC16F88-I/P microcontroller was programmed in PicBasic Pro as sonar_car1.pbp. The PDF format may be found at sonar_car1.pdf. 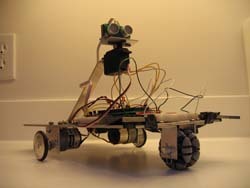 Eight robotic cars were successfully constructed by the students. 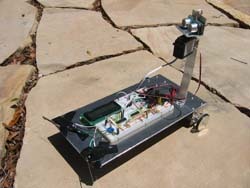 The robotic car navigates around obstacles using the Devantech SRF04 Ultra-Sonic Ranger Finder. 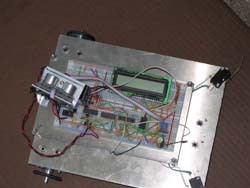 The program pans a servo through 7 positions or angles. At each angle, the sonar emits a pulse and receives back an echo. The program selects the largest distance reading then turns the car to that direction before moving forward for 4 seconds. When pressed by an obstacle, the two front bumper switches will make the car reverse and turn away slightly. One problem with the ultra-sonic range finder occurs when the unit emits an ultra-sonic pulse at a slight angle to a wall. The ultra-sonic pulse may bounce or reflect off the wall at a slight angle away from the range finder and not return back. 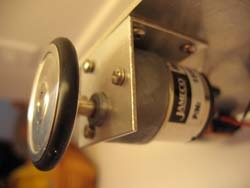 The two bumper switches serve as a back-up sensor in the event of an erronous sonar reading.